The migration period is one of the most perilous stages in the life cycle for birds, and the widespread loss of stopover habitat is believed to be a contributing factor in the decline in populations for a number of migratory bird species. "In the Northeast, nothing provides more comprehensive coverage of the land surface than radar," said Jeff Buler, associate professor of wildlife ecology at the University of Delaware who led the study. 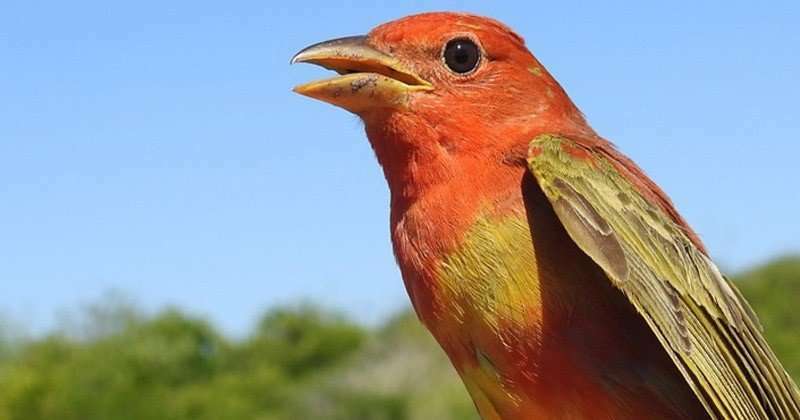 "It detects birds over more than a third of the land area in the Northeast." "We wanted to know: What are birds doing during stopovers, and why are they choosing certain sites over others?" Buler said. Using accompanying maps with the radar data can help managers and agencies identify and conserve places heavily used by migrating birds—including protected areas and places that are not managed with migratory species in mind, such as urban parks. "Before using this radar technology, we didn't have such a comprehensive perspective on migration stopover for the entire region," said Randy Dettmers, landbird biologist for the FWS Division of Migratory Birds. "We can use this information to target conservation efforts for management and protection of stopover habitat where it will have the greatest benefit to birds—including urban parks where forest and shrub habitats serve as important refueling sites for migrating birds attracted to brightly lit areas." For migratory birds, artificial light is never out of sight—birds flying at about 500 meters above the ground can always detect the sky glow of some large city on the horizon—and it appears to be attractive. The results show that migrant bird density increased with proximity to the brightest areas. While the maps are useful for informing management strategies on protected lands—about half of the National Wildlife Refuges in the region show up on the radar – Buler said the data can help identify new priorities as well. "We can see many places with heavy use by migratory birds that are not yet protected," he said. When Gwen Brewer of the Maryland Department of Natural Resources (DNR) looked at the study results, she said, "The Pocomoke River corridor on the Eastern shore just lit up like crazy as a migratory hotspot." "By showing us what stands out as important in Maryland, the study also helps us understand what our role should be in the big conservation picture," she said. "It helps us think about the responsibility we have as part of the larger landscape, and that can inform our in-state process for acquisition, easements, and grant proposals." The full Northeast Migratory Landbird Stopover report, maps and data depicting predicted bird density during fall migration, and a user's guide for these maps are now available in the Northeast Stopover Sites for Migratory Landbirds gallery on DataBasin. How variation in body size correlates with en-route migration performance in a long-distance migratory songbird?